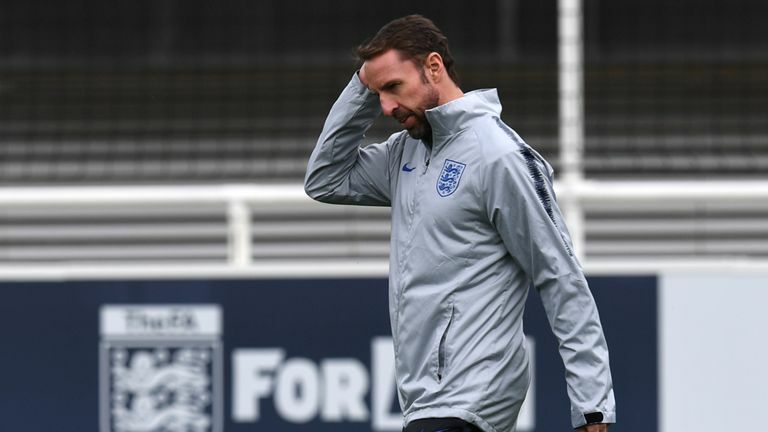 Southgate said: "We always encourage fans to get tickets through official channels because it makes it more difficult for us to help"
There are security concerns for England's European Qualifier in Montenegro with travelling fans buying tickets for the home end, Sky Sports News has learned. 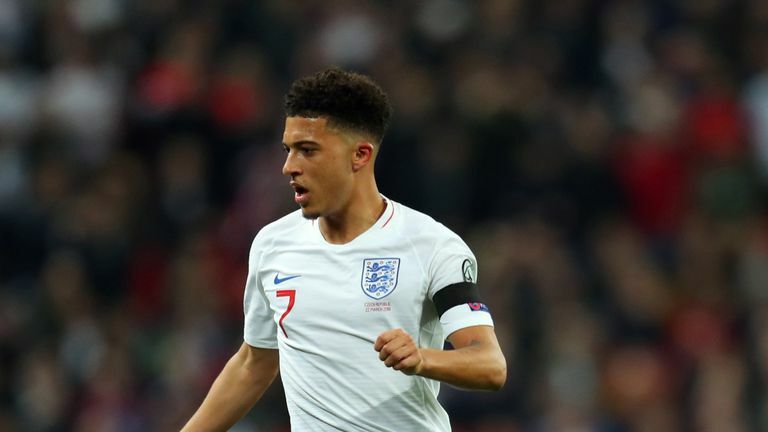 Gareth Southgate's team are in action again on Monday night after they kicked off their qualification campaign with a 5-0 win over the Czech Republic at Wembley on Friday. Tickets with a face value of €10 are being sold for €40. That has led to security concerns at the tiny Gradski Stadium. The last time England played there six years ago, goalkeeper Joe Hart was targeted with missiles and flares from the crowd and defender Ashley Cole was spat at. The Football Supporters Federation has told SSN they think an extra 300 England fans will be in Podgorica without tickets, on top of the 600 England supporters with official tickets in the away end. There are concerns that some England fans may try to buy tickets in the North Stand, where Montenegro's Ultras are housed. It is understood some England fans have already bought tickets in the less volatile South Stand via official channels. They applied through the Montenegrin FA, were asked for their UK passport details, and were still sold tickets. Speaking in Sunday evening's pre-match press conference, England's head coach was asked if he was concerned with the situation. "We've done the best we can to make sure our official tickets have gone to England's travelling members," Southgate said. "We would always encourage fans to get tickets through official channels because it makes it more difficult for us to help them." Regarding the prospect of the team coping in such a hostile environment, Southgate added: "We are guests are so we are being very respectful but our players always have to be prepared. "We always prepare players for everything. Most important is we are preparing tactically and making sure our performance levels are high." A security meeting is due to take place on Sunday evening where the Montenegrin FA and local police will decide their policy on away supporters trying to get into the home stands. The Football Supprters Trust is advising any England fans attending the game outside of the designated away seats to avoid wearing England shirts. 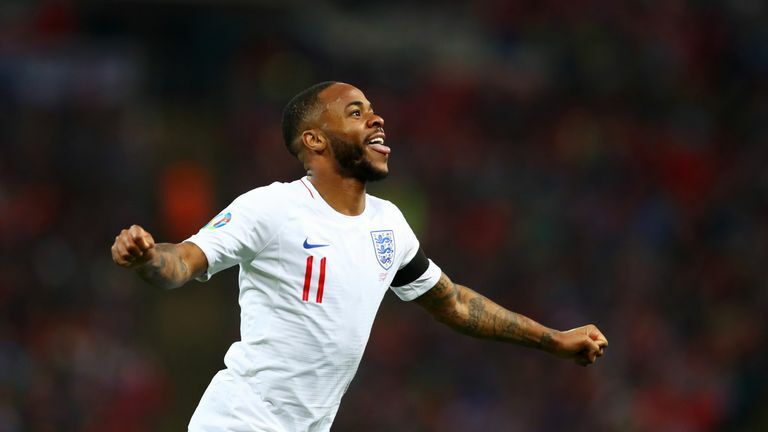 The FA's policy has always been to try to dissuade any England fans without tickets from travelling to away matches, and certainly not to buy tickets in the home stands.